The MIC2039 is a high-side MOSFET power distribution switch providing increased system reliability by using 5% current limit accuracy. The MIC2039 has an operating input voltage range from 2.5V to 5.5V, is internally current limited, and has thermal shutdown to protect the device and system. The MIC2039 is offered with either active-high or active-low logic level enable input controls. It has an open drain fault status output flag with a built-in 32ms delay that asserts low during overcurrent or thermal shutdown conditions. The MIC2039 switches feature an adjustable output current limit that is resistor programmable from 0.2A to 2.5A. The MIC2039 switch also offers a unique, Kickstart feature that allows momentary high-current surges up to the secondary current limit (ILIMIT_2nd) during startup or while operating in steady state. This is useful for charging loads with high inrush currents, such as capacitors. After an overcurrent condition is established, these switches enter into a constant current limit mode unless the die temperature exceeds the thermal shutdown specification. 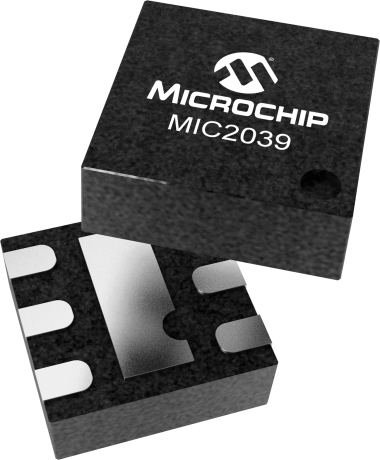 The MIC2039 is available in 6-pin SOT-23 and 6-pin 2mm x 2mm thin DFN packages. The MIC2039 has an operating junction temperature range of −40°C to +125°C. The MIC2039 is a high-side MOSFET power distribution switch providing increased system reliability by using 5% current limit accuracy. This evaluation board features the MIC2039AYMT power switch current limit set for 500mA.